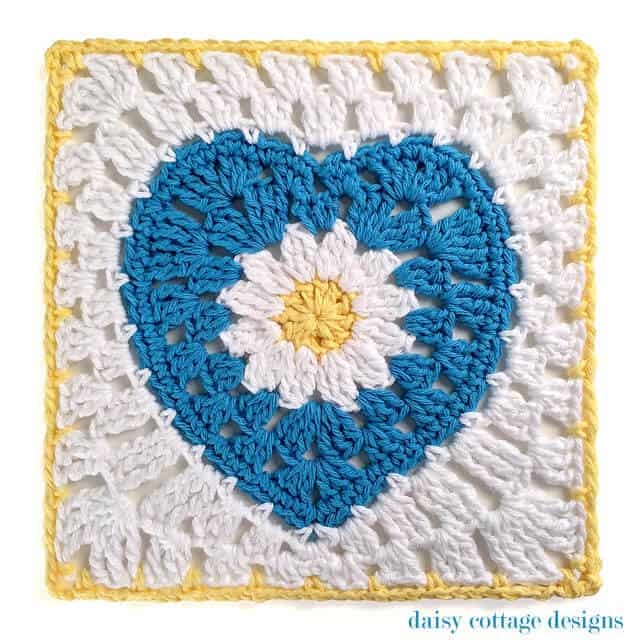 A while back, I posted a pattern for this granny heart with a daisy in the center. From the get go, people were asking if I would provide instructions for making it into a square. I never had the time to sit down and work out the pattern. But, about a month ago, I received an email from someone who had done the work for me. Not only that, but she gave me permission to put the pictures and pattern on my blog. What a sweetheart. If you like this square, you’ll definitely love her blog. So head over and check out Carolyn Christmas’ blog, Pink Mambo. Keep reading to see how you can make your own! The first thing you’re going to need to do is make one of these adorable hearts. You’ll use the same hook, same weight yarn, etc. You’ll just add a few more rounds to make it into a gorgeous block. So head on over to this post to see what materials you’ll need and to get the beginning of the pattern. 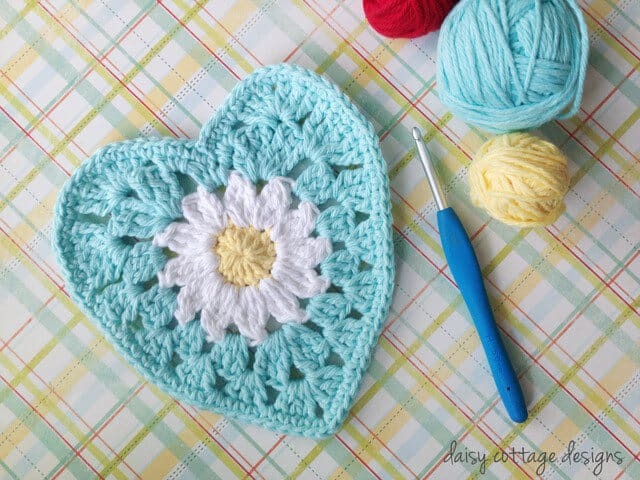 After you have a completed heart, you’ll use this pattern to make it into a square. Notes: For information on the DTR, click here. 3 hdc in next ch-sp, ch 1, join with sl st in top of ch-2. Cut yarn and weave ends. Round 4: Join yellow with sc in any corner, ch 3, sc in same sp, (ch 3, sc in next ch-sp) around with (sc, ch 3, sc) in each corner, join. Cut yarn and weave ends. Again, a huge thank you to Carolyn Christmas for sharing how she made this heart into a beautiful square! Thank you for sharing this beautiful pattern. 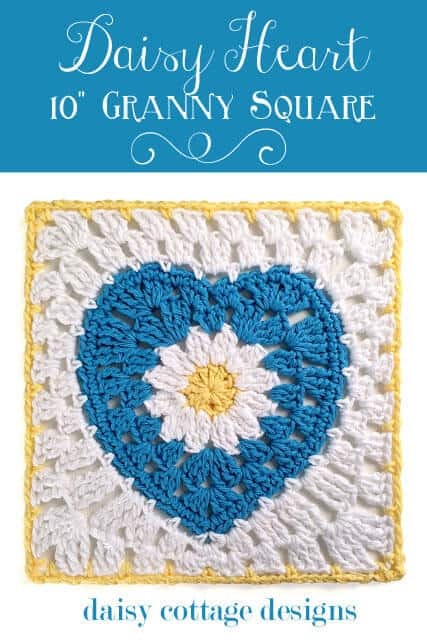 I went to the website suggested and I found the 10inch Margaret Square…I guess one is to incorporate this square onto the heart? Can you help? This is a little confusing for me but I love the heart you made! Thank you for sharing. The website should show how to work the heart around the daisy 🙂 Then come back here to make the square. It couldn’t be because I added to someone’s pattern. I can’t copy her work on my blog… so I send you there first, then have you come back here to finish.